The Niagara Falls PowerHawks swept the Oswego Stampede in a pair of games over the weekend. With a 4-1 victory, and another 5-1 win on Sunday, the PowerHawks have bypassed the Stampede for possession of third place in the Northeast Division. After 19 games on the season so far, Niagara Falls has 23 points, only four points out from the Binghamton Junior Senators in second. Oswego’s Dimitri Christou opened the scoring on Saturday 13:36 into the first period. Nicholas Sparks and Malik Lamont Stokes assisted on the lone goal of the first period. PowerHawks’ scoring leader, Andrew Logar, tied the game 3:58 into the second period, with Brandon Schweickert and Frankie Bodami providing the assists. The third period was all Niagara Falls as they scored all three goals tallied in that frame. Logar notched his second of the night, this time on the power play at 3:23. Assists were credited to Justin King and Schweickert. Stephen Minichiello followed up at 9:47 to extend the PowerHawk lead to 3-1. Mitchell Thornton assisted on the power play marker. Branden Tripi dumped one in the empty net to seal the score at 4-1 for the visiting PowerHawks. Logar provided the assist. Josh Mitchell got his first win in a Niagara Falls uniform, stopping 37 of 38 shots. Steven Kozikoski turned away 57 of 60 in the loss. The PowerHawks power play continues to pace near the top of the league, sitting in 5th place in the league with a 41.5% success rate with the extra man. In Sunday’s match up, Niagara Falls opened the scoring, again on the power play. Matthew Minichiello slapped one home with only 49 seconds left in the first period. Justin King was given the only assist on the play. The second period was a tale of the Brandons, or the Brandens. Branden Tripi extended the visitor’s lead to 2-0 with a goal at 2:57. Andrew Logar assisted. At 13:30, Brandon Snyder found the back of the net, with King and Stephen Minichiello providing the assists. Oswego made it to the scoreboard in the third period when Josh Wallace scored on the power play at 5:07. The PowerHawks answered immediately, only 20 seconds later, off the stick of Brandon Snyder, for his second of the night. Nathan Walerowicz and Logar assisted. Matthew Minichiello closed out the scoring for the afternoon at 13:15. Logar added yet another assist to his repertoire. Josh Mitchell got his second win in as many days, turning away 28 of 29 shots. Meanwhile, Ben White stopped 49 of 54 for the Stampede in the loss. 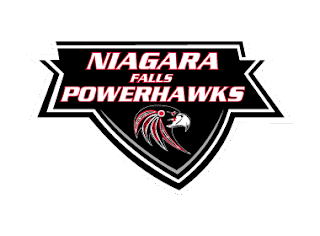 The Niagara Falls PowerHawks next see action December 2nd and 3rd in Pittsburgh against the Pittsburgh Vengeance. The Hawks will next be home December 9th and 10th for a pair of game against the Jersey Shore Wildcats at the Hyde Park Ice Pavilion.